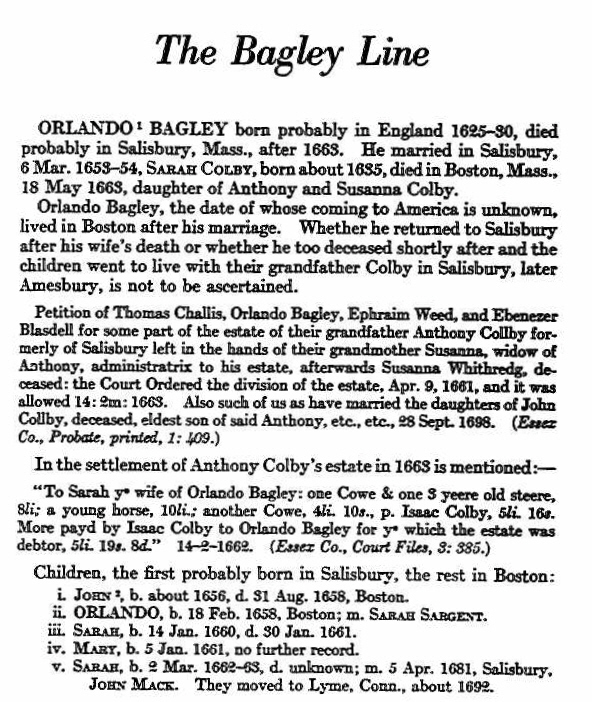 Orlando BAGLEY Sr. (1628 – 1700) was Alex’s 10th Great Grandfather, one of 2,048 in this generation of the Shaw line. Orlando Bagley was born about 1628 in England. His parents were NOT John Bagley and Mary Warren which is another unrelated Biglo family. John Biglo seems to have arrived in Watertown, MA about 1632. Orlando married Sarah COLBY 6 Mar 1654 in Salisbury, Mass. Orlando died in 1700 in Boston, Mass. Amesbury Monument - The Golgotha Burying Ground is also found on Rt. 110 (Macy St.), in Amesbury Massachusetts about a half a mile east. It is the first burial ground in Amesbury but there are no markers. 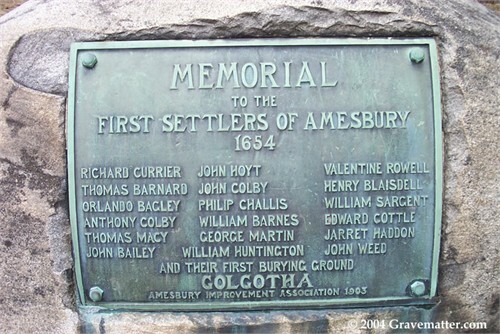 Amesbury Monument – The Golgotha Burying Ground is also found on Rt. 110 (Macy St.), in Amesbury Massachusetts about a half a mile east. It is the first burial ground in Amesbury but there are no markers. Over half the first settlers names on this memorial are our ancestors. They are: Richard Currier, Orlando BAGLEY Sr., John Bailey, William BARNES, Thomas Barnard, Henry Blaisdell, Philip Challis, Anthony COLBY, John COLBY, Edward Cottle, Jarret Haddon, John HOYT, William Huntington, Thomas Macy, George MARTIN, Valentine Rowell, William SARGENT and John Weed. Sarah Colby was born in 1635 in Cambridge, Middlesex, Mass. Her parents were Anthony COLBY and Susannah WATERMAN. Sarah died 18 May 1663 in Boston, Suffolk, Mass. Amesbury, Essex, Mass. 13 Jan 1728 Amesbury, Essex, Mass. The line continues on to John Baguley 1616, Randall Baguley 1578, Robert Baguley (Bigelow) 1556, Randall Baguley (Bigelow)1518, Ralph Baguley (Bigelow)1500. I can’t find any details for Mary’s supposed husband William Colby which is odd given how close the two families were. Sarah’s husband John Mack was born 6 Mar 1653 in Inverness-Shire, Scotland. John died 24 Feb 1721 in Lyme, New London, CT. This entry was posted in 12th Generation, Historical Monument, Immigrant - England, Line - Shaw, Pioneer and tagged Amesbury. Bookmark the permalink. 13 Responses to Orlando Bagley Sr. Very interesting. The surname Mack got Americanized to Macke and later McKee. My grandfather was Earnest R. McKee of Seminary, MS. I’ve tracked his family directly back to John Mack and to Orlando and even Hammon de Baguely. 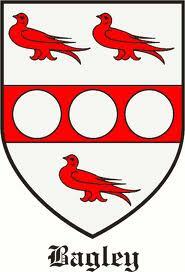 It appears that I am a direct descendant several hundred years later! Thanks Chuck, that is very interesting. I have enjoyed the times in my life when I volunteered to help archaeologists.